CES has come and gone, but the question remains: which gadgets are consumers most likely to buy? 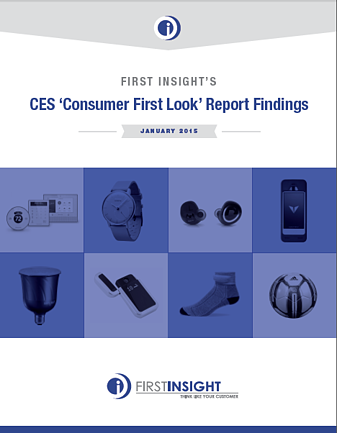 Looking to find out just that, First Insight ran its predictive analytics on nine of the hottest gadgets that debuted at CES to see which ones consumers are most excited about. Products tested included: Honeywell Lyric Thermostat, Adidas Smartball, Withings Activite Pop Watch, Dash Headphones, Quitbit, Om Smartshirt, Sensoria Smart Socks, Quantum Security Case and Sengled Lighbulb. The top three gadget winners were the Honeywell Lyrics Thermostat, Withings Activite Pop Watch and Dash Headphones. Although preferred pricing for gadgets varied, our findings surprisingly show that late adopters, Android users, men and baby boomers are all willing to pay more on average for gadgets, with baby boomers ranking as the most likely to do so. 69% of consumers that participated consider themselves early adopters, with 57% being Apple users compared to 38% who use Android devices. While Apple is currently the most popular among those who participated, more millennials are using Android. Honeywell Lyric Thermostat scored highest overall in the study with 61% of consumers reacting positively and willing to shell out $7 more than the list price of $280. GenX men in particular loved the device and are willing to pay almost $30 more. Withings Activite Pop Watch scored highly with women, a 5% difference when compared to men. Women are also willing to spend $10 more than the $149.99 asking price and love the gadget’s fashionable style. Dash Headphones received the highest consumer positive reaction (68%), however the company’s list price is $88 above their purchasing sweet spot. Insights like these can help manufacturers make adjustments to design, features, pricing and marketing strategies early on, ensuring their final product will be a bigger hit. Data driven results are especially useful when companies preview their products to the public at shows like CES.